Did you recently experience a property crime like burglary, theft, or damage? Are you in search of a local locksmith to change your locks, install burglar-resistant glass in your windows, or setup cameras to monitor the perimeter of your home? As the premiere locksmith in Princeton, Firstline is here to help. We’ve served the city and the rest of New Jersey for more than 25 years with comprehensive lock services for residents, business owners, and beyond. If you’re concerned with being one in 61 affected by a property crime, we can help! In this post, we’ll share three proven ways to increase the security of your home. Not sure which upgrade to choose? Give us a call! Otherwise, read this post to learn more. It may seem simple to install new exterior doors, but it’s not easy. You want to choose a door that’s metal or has a solid core. This is to prevent blunt force break-ins if a deadbolt holds up against the attempt. Next, you want to install heavy-duty, high-security deadbolts and door knob locks. The “heavier” deadbolt will withstand more serious break-in attempts, and, in most cases, an advanced door knob lock will decrease the chance of lockpicking attempts being successful. Finally, consider installing wide-angle peepholes into all your exterior doors. This gives you sight outside your door without opening it. Beyond locks and shatter-proof glass, you will want to research and invest in an advanced home security system. These systems can involve components, such as motion-sensor lighting, cameras, and alarms. They can also include app, police, and neighborhood alerts. What’s more, a camera system may be able to capture the identity of the criminal so the proper authorities can bring the person to justice. For more than 25 years, Firstline Locksmith has serviced Princeton and the entirety of New Jersey with expert locksmith services. If you’re in need of a qualified, highly-trained locksmith professional, we can help! Our window and door lock services are unparalleled. 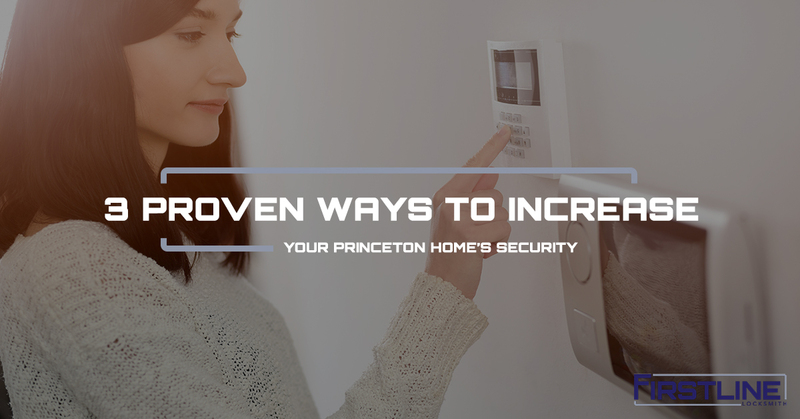 We take pride in helping the residents of Princeton regain home security and reestablish the feeling of being safe. Call us today!